Joining a lineage society is a goal for many genealogists. Reasons for joining are as varied as there are societies. Whether it is to honor a specific ancestor, recognize military service, or to ensure that some of your research is preserved, applying for a lineage society is a great way to improve both your documentation skills and your organization skills. There are countless lineage societies, each with their own criteria for membership. (Though I'm still waiting for a society to celebrate "emigrant mutts.") Some are for descendants of participants in a particular war, others are for early settlers in a state or county. Some are based on occupation. Others are based on descending from royalty or a passenger on a specific ship from the old world. Even though all these societies are different, the methodology one uses in proving and documenting the lineage is the same. When we are looking to try and link ancestors to a certain "type" of service with the idea to join a particular society, we need to identify who might be an appropriate ancestor to pursue. I use a table to list out every surname, organizing them by married pairs. For example, I am pursuing Revolutionary War Service and then interested in knowing if any "found" service qualifies for Daughters of the American Revolution or, for the males in my family, Sons of the American Revolution and/or The Society of the Cincinnati. Always check the criteria for eligibility, even if you've applied to a similar society in the past. Different societies have different rules about who they will accept as a proven ancestor. For example, a "first families" or "pioneer families" program in one county might have a different year for the residency requirement than the county next to it. Be sure that you use sound genealogical research practices. (A good guide is the National Genealogical Society's Standards for Sound Genealogical Research.) Focus on primary and original vs. secondary and derivative. Examples of primary sources include vital records, census records, probate records, church records, and military records. Secondary sources include things like published family histories and county histories. As you are collecting your documentation, remember that original sources are better than abstracts or transcriptions. If you have found a death date in a book of abstracted death records, take the extra step to get a copy of the death record itself. As I mentioned, different societies have different rules for eligibility and different rules for what they will accept as documentation. Be sure to familiarize yourself with the current rules before you begin the application process. If you're working with an ancestor who has been proven previously, ask if you can tie into that application at the nearest common ancestor or if you have to prove your lineage all the way back. Some societies, such as the Daughters of the American Revolution, will not accept applications before a certain date as proof for current applicants. There are many reasons for this. The society's eligibility requirements may have changed. The standards for documentation may have become more stringent. Multiple ancestors with the same name may have been mixed up in earlier applications. Even if you cannot use that earlier application as proof, see if you can obtain copies of what was used as documentation. There might be documents in there that will be valuable to you in your research. Don't forget the spouses. Though they are secondary to the lineage, their births and deaths must also be documented. Now that we have identified our target ancestor and we've begun collecting documents, we need to keep track of everything we have proven. I have found a matrix to be a great way to keep track of what relationships and events I have documented. 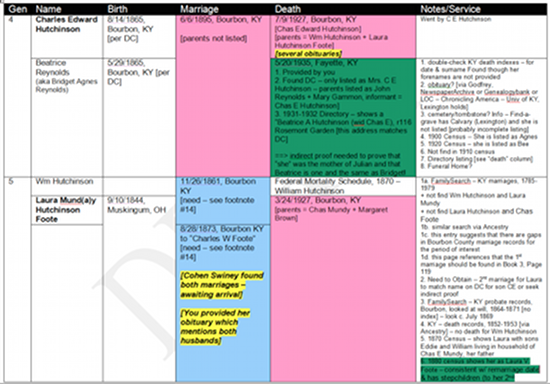 I use color-coding to help give me quick visual cues as to the status of my efforts/success. As I find material, I color code it. Pink = proof obtained. Green = indirect proof. Blue = proof is still in process. Yellow = to-do items or questions I need to address before sending in the application. Direct evidence is preferred to indirect evidence. However, there are times when we cannot find a primary document that spells out a connection, such as someone is the daughter of this person we claim is her father. In such cases, we made need to use a lot of evidence and write up a "proof argument" to make our case. (See the Board for Certification of Genealogists' Genealogical Proof Standard.) Be very linear and logical in your presentation. Provide enough detail to prove your point and not so much as to overwhelm the person reviewing your application. Note: Not all lineage societies will accept a proof argument as proof. If you have such a case in your lineage, check with the society before submitting your application. Check for ancestors who have already been proven. Send copies of the documentation, rather than the originals. Label the documents according to the rules of the society. Keep a copy of your application so you can easily answer any questions that arise. Submit your application well in advance of any deadlines, in order to give yourself time to gather more documentation if needed. Don't use highlighters; they can black out the writing if it is photocopied or microfilmed. Don't send in original documents; you likely will not be getting the materials back. Don't send in every source you have ever found on the people listed in your application; present "select" and "key" documents which make your case without going overboard! Don't bug the organization, genealogist, registrar, etc. ; they are usually volunteers. Don't wait until the last minute to apply; you might not have time to get more documentation if it's needed. Whether you are applying to honor an ancestor or as an exercise in compiling documentation, working on a lineage society application is a great way to hone your research skills.